20% off all day, every day! The Non-GMO Project Verified seal is a guarantee that an item is manufactured using the very best practices for GMO avoidance. The USDA certifies truly organic products on the basis of farming, handling, processing, distribution, and labeling practices. All products certified by Vegan Action must comply with the philosophy of “ethical veganism,” which rejects the commodity status of animals. Globally recognized as the leader in genuine Kosher certification, this network of rabbis guarantees a product’s observance of kashrut. Bitter Melon Gold is formulated using an exceptionally pure, organic bitter melon extract that can help support healthy glucose balance and weight-loss. 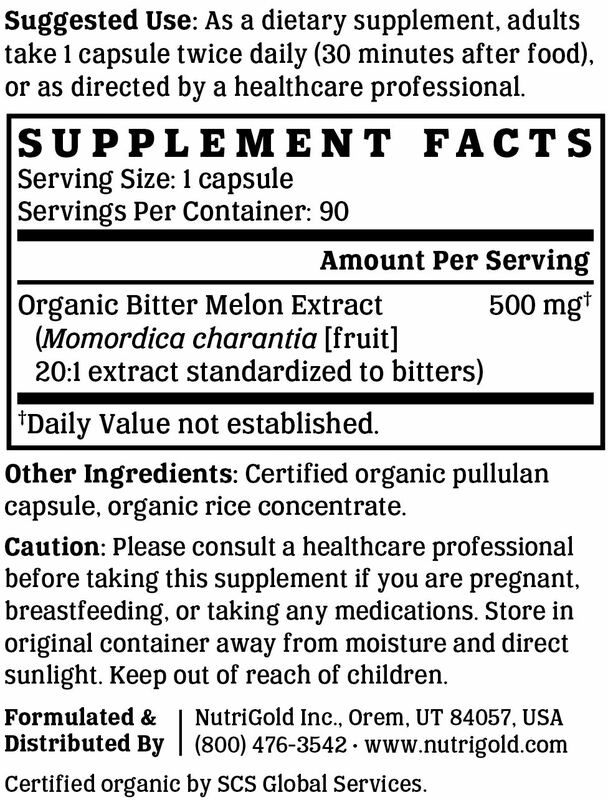 Bitter Melon Gold is manufactured in the USA to industry-defining quality standards and is verified by independent third-party labs to meet identity, purity, and potency label claims. Bitter Melon, also known as Momordica charantia or Karela, is a tropical and sub-tropical vine of the Cucurbitaceae family and is the most bitter of all fruits. The fruit is most often eaten when green and the skin is tender and edible. The plant contains several biologically active compounds called bitters, including charantin and momordicin, which help support glucose health and weight management when taken in conjunction with a sensible diet and fitness program. Bitter Melon Gold is Non-GMO Project Verified, which provides assurance that the product has been manufactured in accordance with the best practices for GMO avoidance. The Non-GMO Project is North America's premier verification program. The USDA’s National Organic Program certifies products as being organic based on farming, handling, processing, distribution, and labeling practices. The certification indicates that Bitter Melon Gold is grown without synthetic pesticides or fertilizers, and is free of GMOs and antibiotics. Vegan Action has offered vegan certification since 1995. Their official seal is proof that Bitter Melon Gold does not contain ingredients derived from animals or animal by-products, is free of animal-derived GMOs or genes, and is not the subject of ongoing animal testing. Most consumers consider kosher products to be cleaner, healthier, or better than non-kosher products. The Ko Kosher symbol on Bitter Melon Gold is assurance of our brand's unwavering and uncompromising commitment to accountability, quality, and overall safety. We like to make supplements that can be enjoyed by everyone. That's why our products are always compliant with the best practices for avoiding allergens and minimizing cross-contamination. Bitter Melon Gold is free of soy, gluten, egg, milk, peanut, shellfish, and corn allergens. The use of magnesium stearate is a topic of contention in the supplement industry, with some studies suggesting it can have long-term health consequences. Our take on the matter is simple: as long as magnesium stearate has yet to be proven safe, we WILL NOT use it in any of our products. Consistent with our guiding principle to “do no harm,” Bitter Melon Gold is manufactured without the use of additives or preservatives. It contains absolutely NO contaminants, pesticides, herbicides, harmful additives, residual solvents, magnesium stearate, or hexanes. Like all NutriGold products, Bitter Melon Gold is subject to over 140 purity and potency assays by independent, third-party labs to ensure that the product meets or exceeds its claims. So, you can be certain that what's on the label is what's in the bottle. Nothing more, nothing less. No articles featuring Bitter Melon Gold have been published yet.